The Faculty of Tourism and Hotel Management organized a costume party on Tuesday 8/11/2016 under the auspices of Safari Club. 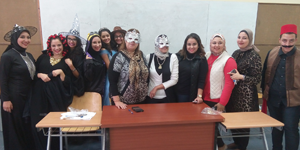 Many students of different academic classes took part in the costume party in the presence of Prof. Amany Refaat, the Faculty Dean and a number of the faculty members. Mirth and merriment spread through the party. Prizes were distributed among the outstanding costumes.